After my post from last week I noticed I just need 8 more clanrats to be able to field a legal Skaven army in 3rd ed. so I decided to go for it. 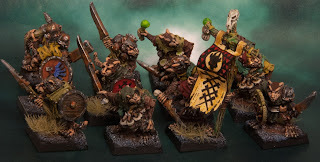 I painted another 12 clanrats to have a grand total of 24. My goal is to have two units of 20 clanrats, both with a full command group. One of the units will be made up of the plastic rats, which I call "the rookies" and the other will be the lead ones, "the veterans". I have chosen more vivid colours for the veterans, also adding a bit more of details to the shields. The next step is to paint the remainder of the clanrats to be able to field my units. That will mean another standard bearer at least, I love painting them as I am really happy with the end result! You can spot one of the veterans fielding a stolen Dwarven Shield.